Health Science teachers in high school CTE programs tell us they lack time to create engaging and relevant health science curriculum. There are many challenges that create this lack of time for instructors, such as changing standards and keeping old health science lessons up to date. Where does a health science teacher, especially a new one, start with a high school health science curriculum? And how can an experienced health science technology teacher continue to keep their lessons relevant? Many new health science technology teachers share a background in the healthcare industry, but are just beginning their work in education. It may seem overwhelming to map out a curriculum when you’re completely new to teaching. Building a health science curriculum, especially from scratch, is hard work. It will take you many hours before teaching begins. Here are a few tips to get you started whether you want to make a CTE health science curriculum, middle school health science curriculum, or high school health science curriculum. CTE Administrators want to make sure there is consistency in their health science program, especially if they have multiple teachers, buildings, and programs in their district. Many states have their own health science standards, and others are very focused on the National Consortium for Health Science Education. Understanding the standards your district follows and any regulations for curriculum are the first step. Most Health Science programs have a Principles of Health Science course that lays the foundation for that career pathway in their district. Make sure to include the basics topics of that course, such as History of Healthcare, Anatomy and Physiology, Medical Terminology, CPR Basics, and Medical Math. These tend to fit into many other classes too, including specialized classes for home health aides, medical assisting, and other professions. Once you know your courses and standards, make a quick list of the topics you need to cover during the year. Knowing what you want to cover in your health science curriculum is only half the battle. Now comes the tiresome search for health science lesson plans. Do you feel like this teacher? The National Consortium for Health Science Education (NCHSE) is a national partnership of individuals and organizations that help health science educators improve their instruction. NCHSE offers information about the most recent healthcare trends, jobs and industry information, and also some great resources for health science technology teachers to incorporate into lessons. You can learn more about the National Consortium for Health Science Education here, and click here to see some of their free health science lesson plans. Don’t be afraid to look at examples of existing health science lesson plans as you begin to work on your curriculum. If you have a bit more time to spare, searching through blogs and websites can yield great ideas and lessons plans for your health science curriculum. You will find some good health science curriculum resources if you just know where to look. Finding out what curriculum and resources other health science teachers use in their classrooms can be a big help. Some health science teachers are finding great success by using blended learning curriculum in the classroom. Don’t get overwhelmed when thinking about this… here’s a tip from NCHSE for organizing your high school health science curriculum in a way that makes sense and helps your students understand the information. When asked about trends that are affecting how high school health science courses are being taught, Carole Stacy (Executive Director of NCHSE) brought up the idea of Concept-Based Curriculum. Concept-Based Curriculum involves covering a foundational idea in a broader context before diving into the details. Use this idea in your health science curriculum by beginning each lesson or topic with a broader theory. When students have a solid comprehension of this idea, move into the details. An example is to start with the concept of oxygenation. Once your students understand this broader concept, you will introduce more detailed information such as pneumonia and asthma which relate to the original concept of oxygenation. If you are just putting your curriculum together, or if you’ve been teaching health science for a few years, you need to always be thinking of how to keep your health science curriculum relevant and up-to-date. Do your Principles of Health Science courses get your students excited about health science education and careers? Do you think your lessons are helping your students decide to pursue healthcare as a career? There are a few simple ways that you can keep your health science lesson plans relevant and interesting to your students. One challenge that comes up with health science teachers trying to stay relevant is the constant thought of changing standards. You need to make sure as the standards change you are flexible and quick to react. 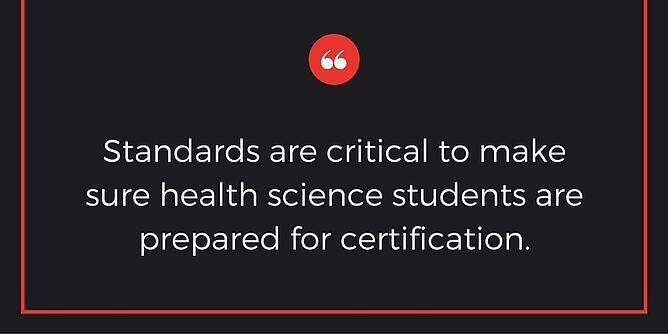 Standards are critical to make sure health science students are prepared for certification. That puts a lot of pressure on you as the instructor to not teach outdated information and improper techniques. So what can you do about it? Find a good base curriculum or resource that adheres to state and national health science standards. One that is updated as standards are added and changed would be ideal. Just because the standards change doesn’t mean your entire health science curriculum needs to be redone! Not only does your content need to remain relevant, your method of teaching will have a big impact on how your students feel about learning these important health science topics. Combining multiple health science curriculum resources in a blended learning approach will not only keep your students engaged, but will help them learn better. Use your current curriculum along with multimedia features like online quizzes, YouTube videos and other resources. Another tip is to make sure your students get a lot of hands-on time. If you use an online resource, don’t just focus on that. Real-world projects and scenarios make learning come alive for your students, and ensures they learn the important skills a healthcare worker needs in their careers. Never Stop Improving Your Health Science Curriculum! The key to keeping your health science curriculum relevant and exciting is to continually revise it. You should always be looking for interesting content and resources to build into your existing lessons. However, budgets are tight and so is your time, so never be afraid to lean on blended learning resources that make make the entire process easier for you. Whether you’re just beginning as a health science technology teacher, or you’re looking to update outdated curricula, a few simple steps can help you improve your health science lesson plans. With some added technology, organization, and awareness you’re well on your way to an engaging and educational year of teaching health science!